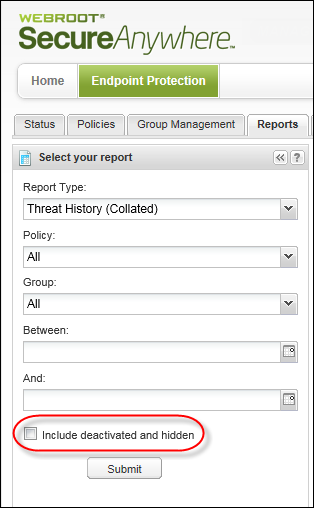 To view a summary of detected threats, you can generate the Threat History (Collated) report. This report shows a bar chart for endpoints with detected threats and blocked programs. From here, you can create overrides for blocked programs and restore files from quarantine. 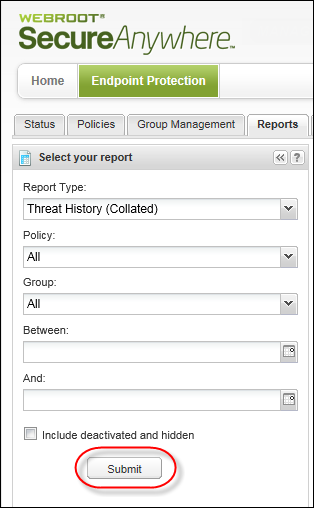 Note: To view a summary of threats, see Generating the Threat History (Daily) Report. 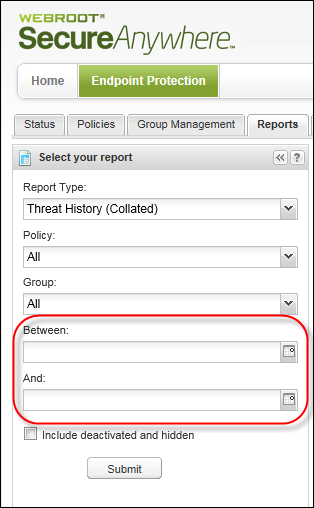 The Threat History (Daily) report is just a summary; you cannot manage threats from that report. 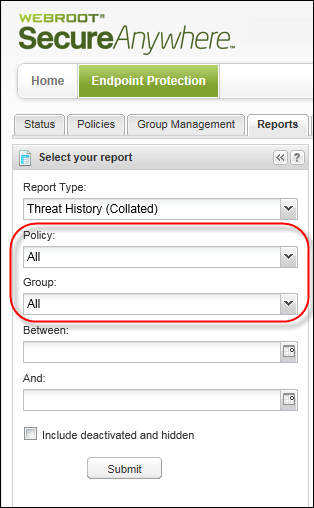 View all threats within a selected policy or group, which is helpful if you need to narrow search results to a specific set of endpoints. From the Report Type drop-down menu, select Threat History (Collated). 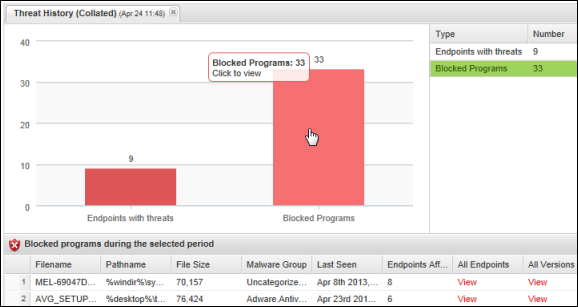 From this panel, click one of the bars to view more details about Endpoints with threats or Blocked Programs. If you click the Blocked Programs bar chart, the bottom panel shows details about the programs. From the bottom pane, click the View links in the All Endpoints and All Versions column to view more information. The View link under All Endpoints displays this panel. The View link under All Versions displays this panel. To set an override for the file or restore it from quarantine, select the Endpoints with threats bar to display more information in the bottom panel. Create override — To bypass Endpoint Protection and designate the file as Good (allow the file to run) or Bad (detect and quarantine the file), from the Command bar, click Create override. For further instructions, see Applying Overrides to Files From Reports. To show or hide additional data for the report, click a column header to display the drop-down menu, then select checkboxes to select, add, or remove columns. For more information about descriptions of the data in the columns, see Sorting Data in Tables and Reports.